IT IS THE SPRING OF 1971, the Age of Aquarius. While the serious students at Saint Mary's College and others across America were marching in protest to the Viet Nam War and shouting at the Man, two Glass Packs to be, Jerry Murphy and Julio Lopez, were preparing a little musical protest of their own, one they hoped would snap the cuffs on the hands of time, sounding an echo across the great cultural divide between music of the head and music of the heart. 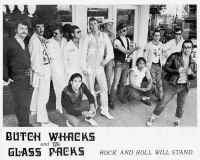 Recall, if you can, no KFRC, no Grease, no Happy Days, no American Graffiti, no Diner, no Wanderers, no Internet, no VH-1, no cable, no PBS specials,no more Wolfman Jack on XERB, no media outlet whatsoever for the sound of Little Caesar & the Romans. By 1971, those songs, that style of music had drifted into the mist; and settled forever like lint in the pockets of certain simple minds; gone from the airwaves like it never happened. Now imagine the shock upon hearing the remotely familiar Sho-Doat-Sho-Be-Dohs of "In the Still of the Night" and the hand claps behind "Runaround Sue" swing from the Student Union lounge as they clashed head on with the screeching guitars of Deep Purple and Canned Heat blasting from the dorm rooms overhead. The Doo Wop sounds of such a far way time were as out of place on a college campus in 1971 as visitors from a distant planet. Two such visitors (speaking of simple minds) began in 1970 as an acoustic duo at the Berkeley Straw Hat Pizza parlor on Tuesday nights and quietly built steam toward a once only on campus performance - a late Spring pre-graduation outdoor concert, when a third (Craig Martin) and fourth singer (Bill Lazzaretti) signed on. Craig, a natural choice because he was and is an utterly shameless, reasonably handsome, hambone/baritone, had long since proven his ability to stay in character by spending hours covertly perched up against the ceiling of his dorm hallway, suspended wall to wall by the tension of his fully extended hands and feet dressed as the Mad Gnat startling the occasional unsuspecting passerby below with "Got a Light?" That, and he could sing "Its Only Make Believe" like his hair had caught fire. Laz, a long necked goose, came loaded with a formidable pair of dancing shoes and strands of taffy for legs connecting those flying feet to the twitching torso above. Sal Mineo on stilts. Applying for the position of Rocco Vaselino, Laz affirmatively answered the question of the day, "Are You Experienced?" with a resume that included a stint as the rhythm guitarist for "the Humans" a mid-sixties North Beach San Francisco teen club band that covered the Top 40 radio hits of the time, the likes of the Young Rascals, Paul Revere & The Raiders and Them; and, he owned a 12 string Rickenbacker. "Like ringing a Bell", Laz promised, it would all come back. But first, he advised, we will need an unforgettable, funny catchy name to call ourselves. Soon thereafter, a fellow classmate Danny Ritzo, a cross between Ghandi and Buddy Holly -- blade thin, with bug eyes framed in real black horned rim glasses and a natural waterfall pompadour -- appeared and offered his services. Danny, it turned out, owned a drum set, and beyond comprehension kept it set up as an altar on permanent display in his dorm room. He was drawn like a salmon upstream when he overheard the then unnamed quartet rehearsing the Del Vikings' "Come Go With Me" a capella, and promptly volunteered for Glass Pack duty, although it wasn't called that yet. And so a drummer was added. Danny too promised authenticity - a natural because he grew up in East L.A. and had at age 14 played in the Vato band, "Shorty & the Enchanting Sounds" watching from behind the cymbals the older teenage Cholos make out to "Angel Baby" and "Eddy My Love " - tight sweater music was in his blood.